Kawempe Muslim Secondary School was closed yesterday, after fire gutted a dormitory just days after another dormitory was burnt down. The decision, described by Hassan Kakomo, chairman board of governors, as painful, followed a marathon meeting after distressed parents threatened to storm the school and pick their children. “We have painfully made this decision following the unfortunate situation,” Kakomo said as he addressed both parents and students. He said the school, having found itself in “a very unfortunate moment”, was left with no choice but to close down albeit temporarily. Parents, who camped outside the school as early as 6am, had threatened to enter and pick their children, reasoning that the school had failed to protect them. The students sent home include those in classes one, two, three and five, with the candidate classes left behind to complete their final exams. The date for their return is still unknown. This has been a turbulent week for the administration, which experienced a strike and two fires that have not only left many boys without any property, but also seen two admitted in hospital with broken limbs as they attempted to jump from the fire-gutted four-storey dormitory. No wonder the head teacher, Burhan Mugerwa, was reported to have collapsed when news reached him that a fire had broken out. On October 14, the first fire gutted the girls’ dormitory, leaving 93 senior two students with almost nothing. None of them was hurt in that incident. Police is still looking into the cause of the fire. Three days before the first fire, students led by S.5 and S.6 boys went on strike citing poor sanitation, poor meals and congestion in dormitories. But the school administration, with the help of police, suppressed the strike and suspended all S.5 and S.6 boys, requiring them to come back with Shs 50,000 each in compensation for property destroyed. When The Observer visited the school premises on Monday, there was a huge stinking garbage pit behind the makeshift kitchen where students have their lunch since the school has no dining hall. The students complain that the food is bad. It is also served on metallic plates which they further complain can be too hot to handle. 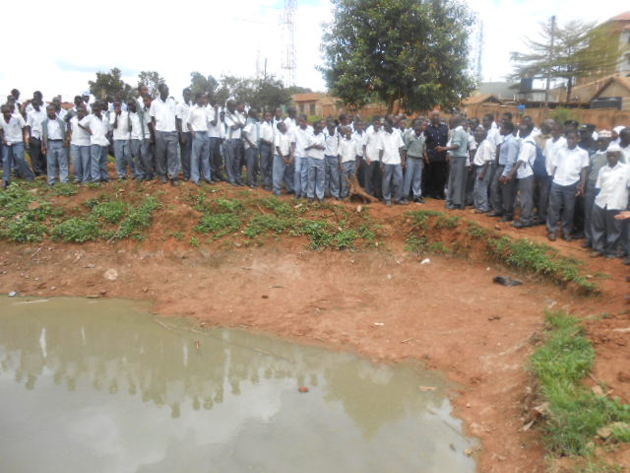 The drainage system at the boys’ wing leaves a lot to be desired, with a broken sewage pipe that runs down the nearby residential area towards the school sports grounds. “Residents have always come to complain about that sewage ditch, but the school maintains a deaf ear,” one student said. The situation is not any different at the girls’ wing where the sewage is connected to an open pond, leaving an intolerable stench. However, a teacher, speaking on condition of anonymity, claims the students were simply using the poor sanitation as an excuse. To him, the real reason for the strike is indiscipline, following the expulsion of students who were found to be drug abusers. Unhappy with the school’s decision, the rowdy students decided to strike because they felt the decision was unfair. That reportedly triggered off a chain of actions climaxing in the two fires. We also understand the students are terrified of Dr Hassan Ddumba, the school’s disciplinary committee (DC) chairman. “He is a dictator in his own capacity, corporal punishment and expulsion are his close allies, the school is like a maximum security prison,” lamented one student. Last week, Ddumba is reported to have expelled 20 students after they complained about conditions at the school. Ddumba refused to comment on the accusations, instead referring us to the head teacher who also excused himself for a board meeting. The head prefect, Issa Ssekandi, admitted several students had been complaining about the conditions at the school and called for Ddumba’s dismissal. “Before the strike and the fire, students approached me and expressed their grievances. I tried to involve the head teacher, but he was always busy,” Ssekandi revealed. Following the Sunday fire, the Inspector General of Police, Lt Gen Kale Kayihura, visited the school and immediately called for its closure. “I doubt whether any sane parent can agree to see their children in such conditions. This situation is so alarming,” said Kayihura. The school houses some 1,500 students but facilities are inadequate. There is only one four-storeyed boys’ dormitory designed to accommodate 400 students but currently housing 600. At the girls’ wing, despite sleeping on triple deckers, the beds are separated by less than a foot. The Education ministry recommends at least one metre. 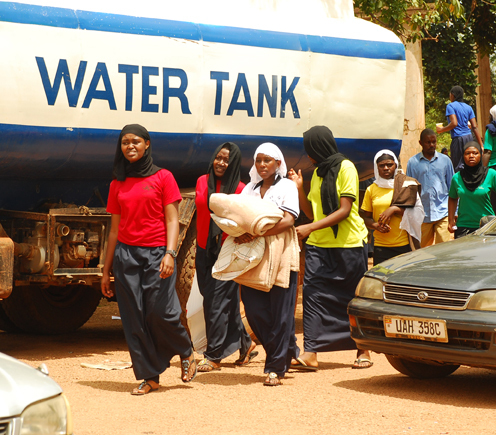 The school also lacks a flowing water system, with water collected from the nearby water springs. Kayihura summarily instructed the school administration to put emergency exits in all dormitories and also install fire extinguishers.